Uncle Thoeun was the very first villager to step up and organize his community to drill their first community-based deep water well. It was dry season, several years ago, and the at that time, the only water available to villagers was found in man-made water holes out in the distant rice fields. The fertilizer & pesticide saturated water made all the villagers sick, and was hard to fetch and bring back to use for home-based agriculture. As a result over two in every three family had to send away a relative to seek opportunity elsewhere, as a migrant worker. The waterless farmers of Sen are suffering need access to clean water locally in order to produce enough crops to sustain themselves through the dry season, and create an opportunity for their loved ones and themselves to stay in their communities.. The gift of deep waterwell will ensure the healthof hundreds of families by enabling them improve their healthy foods while respecting the water table of their community. But the story of the villagers of Sen Sok also tells us that with each water well, countless families are able to stay together, and are spared the life of a migrant worker. Water helps families stick together. And with each aquaponicbay designed as a re-circulating system, the water is constantly recycled, and can be further cleansed using aquatic plants such as lotus or water lilies. 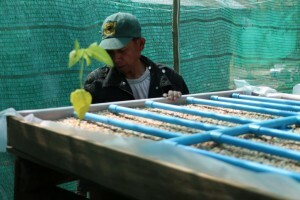 We have a lot of exciting aquaponics projects at work here in Cambodia. 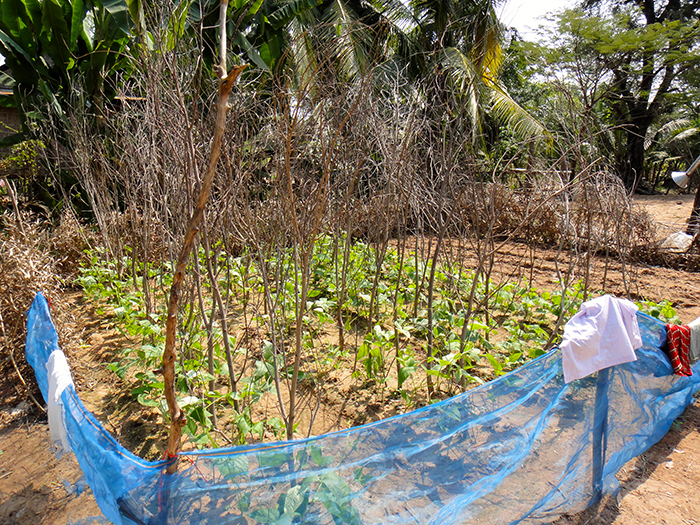 We have experimental grow beds at the Tuk Vil farm, where we are testing KEM (Khmer Effective Microorganisms) in sustainable aquaponics systems to see how their presence alters the rate of growth of plants. The grow beds are all identical in their set up: they each have a cement pot of about 40 fish underneath, which feeds water in a circuit that flows from the container up to the bed itself where the seeds are planted in gravel. Gravel is the first growing medium we used as an alternate for soil. Since gravel does not absorb water, it improves the flow of the system while allowing plants to take in more water for themselves. However, it is expensive to buy and transport gravel, making this option less accessible for villagers who typically live on less than one dollar per day. 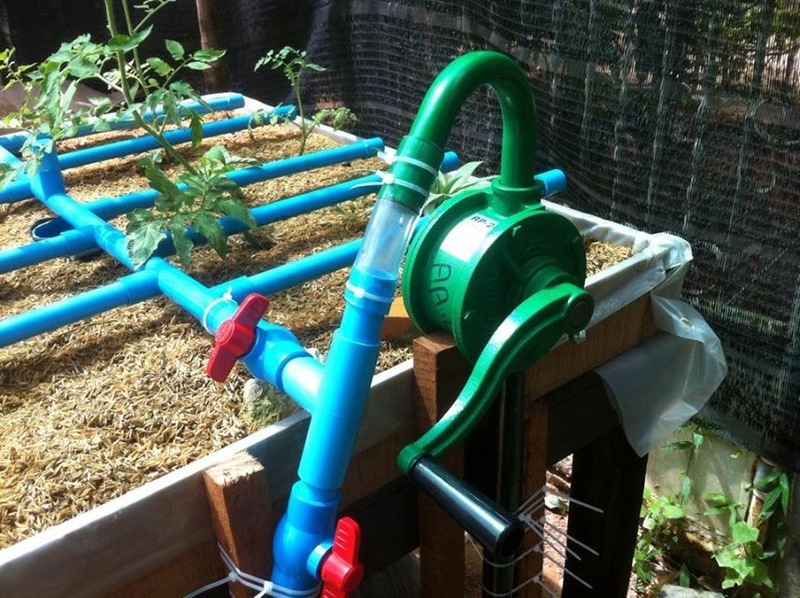 Since our aquaponics systems are meant to act as interventions for this population, other, more accessible and sustainable mediums became necessary to find. Luckily, we have recently had a breakthrough here at Community First in the discovery of a new growing medium that is locally available in abundant quantities and for almost no cost. It also already exists in all the villages that we are working in. This new growing medium is rice husk. Rice husk, the exterior to rice, is the outermost layer of the rice paddy grain, and it is separated from the rice husk in the milling process. Cambodia is one of the largest exporters of rice in the world, meaning that this resource is already in the villagers’ hands, quite literally. Once it is dried out it can be used as fertilizer, but also as a growing medium in and of itself. 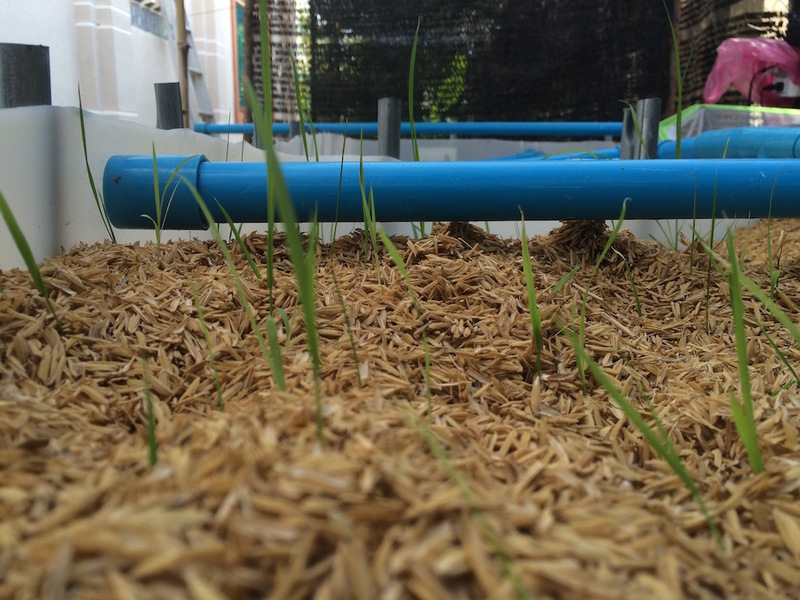 Our own experiments using aquaponics systems with the rice husk instead of gravel have shown that plants grow considerably faster in the rice husk than in either gravel or soil. Rice husk barely absorbs any water, nor does it rot. 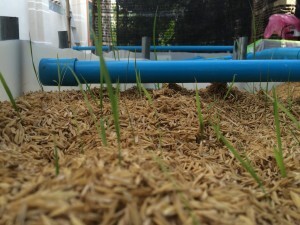 This means it does not have to be replaced often, and water can filter through the rice husk to the plants’ roots more efficiently. This also means that water does not have to be brought through the system as often, which saves both water and electricity. We are currently conducting growing experiments at the Community First lab, growing tomatoes and pineapple in the rice husk medium. In just a few weeks, we have watched tomato vines grow several inches; this is a much faster rate than observed in both gravel and soil grow beds. Combined with the KEM that we are currently testing at Tuk Vil, we hope to see great improvements in growing speed and therefore crop yield, by using only all natural enhancing methods. Keep on the lookout for more formal updates about our breakthroughs and findings coming soon! 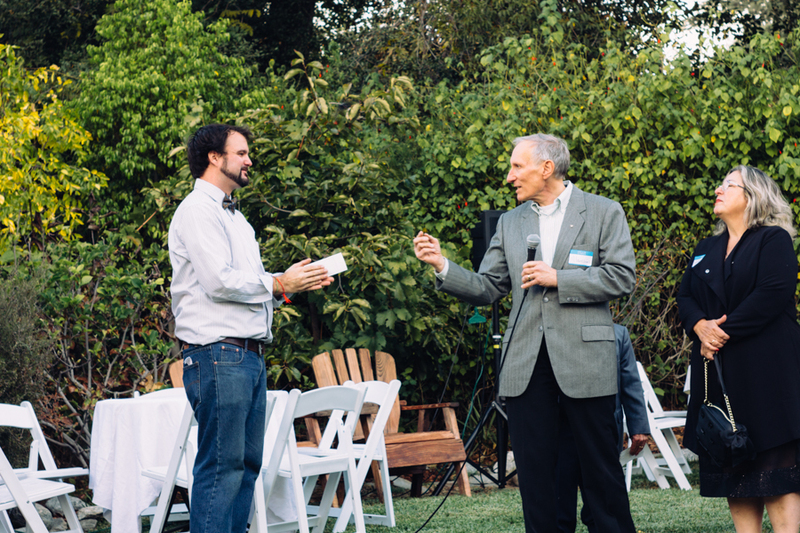 Community First’s goal is to create local solutions to the global problems of poverty by connecting changemakers from throughout the world. 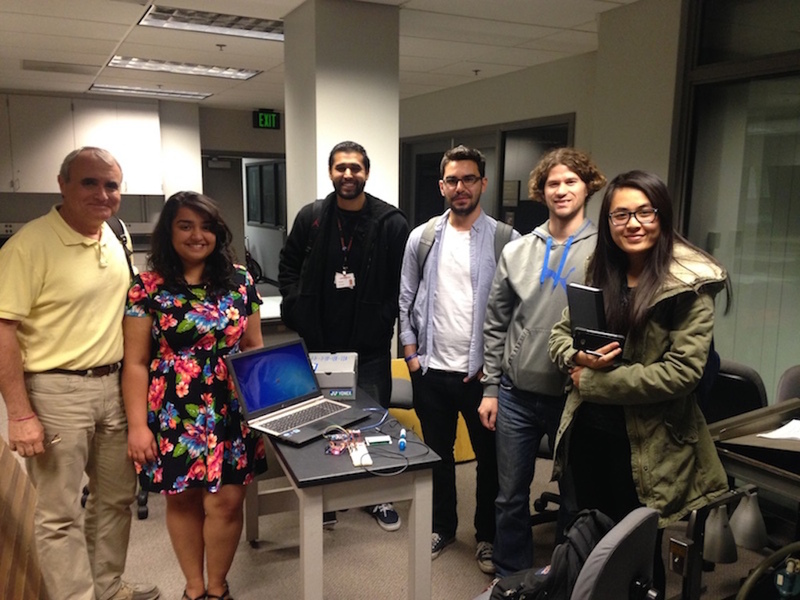 Meet the students of California State University, Los Angeles (CSULA) and how they’re doing their part in turning the challenges of poverty into academic opportunities and professional achievements. The project was started in late 2014 as a graduate engineering project in the Mechanical Engineering lab under Professor Sam Landsberger. The objective is to build a self-sustaining one-tank aquaponics system at CSULA. The experience gained on this project will be very valuable to Community First as they develop aquaponics solutions in rural Cambodia. 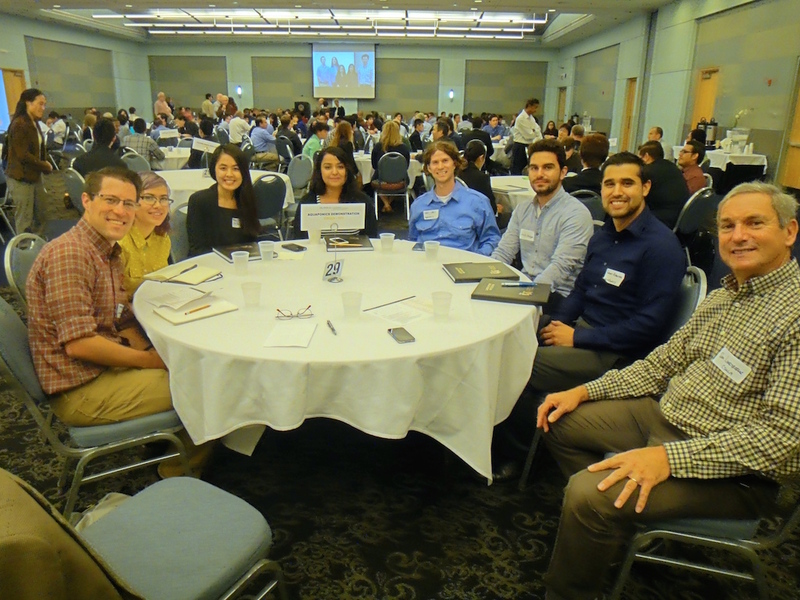 The formal project kick-off included from left to right: Professor Sam Landsberger, Robert Alvarez, Robert Shalgian, Christopher Carlo, Meenu Singh, Measrainsey Meng (all project members), Thomas Hurst (external advisor) and Victoria Hurst (Donegee Media). The team members are bringing expertise in mechanical engineering, electrical engineering as well as excellent software skills. The system they are building is based on a Constant Height One Pump (CHOP) design using an Intermediary Bulk Container (IBC). Two workstreams are progressing in parallel: The fish tank and grow bed are being assembled with the piping and pump system. The sensors are being sourced, tested and integrated to the Arduino based control system. A solar panel system will later be added to the system. From right to left: Measrainsy Meng, Christopher Carlo, Robert Shalgian, Robert Alvarez, Meenu Singh and external adviser JP Mainguy. The ability to monitor continuously the state of the aquaponics system is a key objective of this project. The team is integrating sensors to measure the following parameters: Water temperature, water level, water pH, dissolved oxygen, ammonia. The Arduino controller will display the parameters of each sensor and allow a user to monitor easily the status of the aquaponics system (the initial breadboard is shown on the picture). 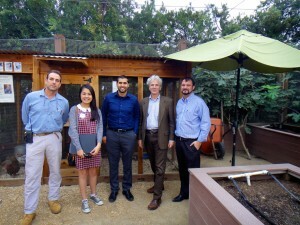 From right to left: Pierre Mainguy (Community First, President), Richard Schulhof (LA Arboretum, CEO), Robert Alvarez (CSULA), Measrainsey Meng (CSULA), Tim Phillips (LA Arboretum). This project is scheduled to continue through CSULA winter and spring semesters. Community First is Moving Forward! …in order to help forgotten communities lift themselves out of poverty. Thanks to the Pasadena Rotary, we are able to provide basic needs for the families of Sen Sok. Resources are no longer so scarce that families have to break apart to seek financial opportunities to provide for their families basic necessities. Since 2009 Community First has been working with these families of Sen Sok to help develop a plan to grow their community, and as a result, they are able to build a brighter future together. We are happy to announce that Community First has received a generation donation of 430 acres of land. We were connected with a professional wild cat trainer who has land and a love for Cambodia. Originally he came to Cambodia to work on a movie project and during his time he fell in love, both with the land, and his wife, an Apsara dancer. Believing in the mission of Community First, he officially offered the land in order to create an aquaponics school for Cambodian farmers to reinvigorate the community and to establish a hub of ancient Khmer craftsmanship like Lacquer production. 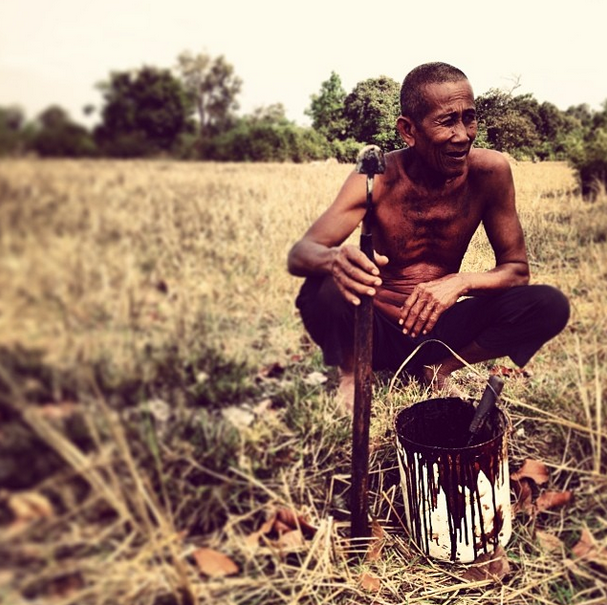 Meet Ta Ly, he is one of the very few remaining lacquer farmers left in Cambodia and his skills can help his entire village. Often, talented craftsmen are isolated from monetary capital and markets to sell their goods, but with our next stage of plans, we hope to establish Cambodia as a major competitor in the high value lacquer market. Lacquer has a long tradition in Cambodia and we are happy to announce that we have teamed up with Master Lacquerer Eric Stocker to help us revive high value Lacquer and reestablish this part of Ta Ly’s heritage and culture. Through the connections and partnerships that we’ve establish we will be able to make change, together. Here at Community First we’ve been having a busy couple of months. We’ve reached out and made amazing strides and partnerships. We have partnered with the Ministry of Agriculture of Cambodia and the APSARA Authority! And right now, our educational network is expanding and we are discussing a potential partnership with another University that is the forefront of social change mobilized by students–the University of Edinburgh in Scotland. 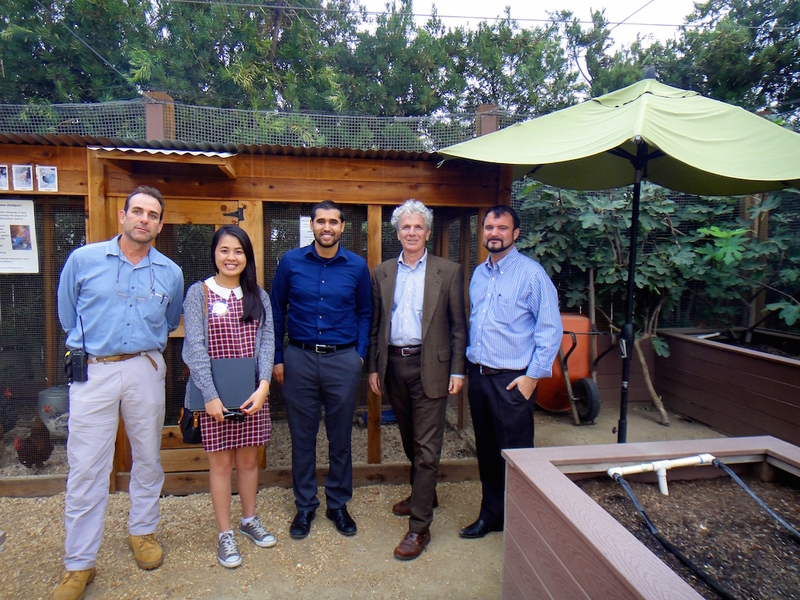 With our current partnership at California State University, Los Angeles we have a team of students who are creating an aquaponics based solution for those who depend on agriculture for economic survival. 80% of Cambodians live off of farming and Khun (pictures to the left) is one of those Cambodian farmers. 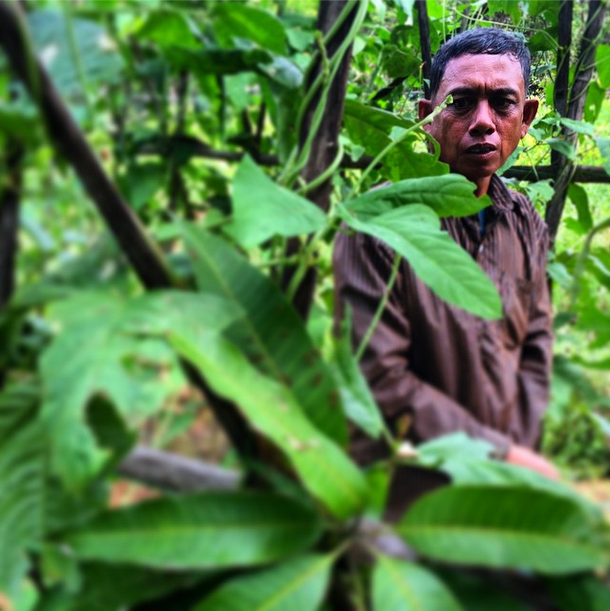 The team at CSULA is working hard to create a solution so that farmers like Khun can combat soil and water depletion–a problem that is not just facing Cambodia, but the entire world. We are connecting changemakers to work together to find holistic solutions to world poverty. We would like to say Thank You! to everyone who came to our annual party. 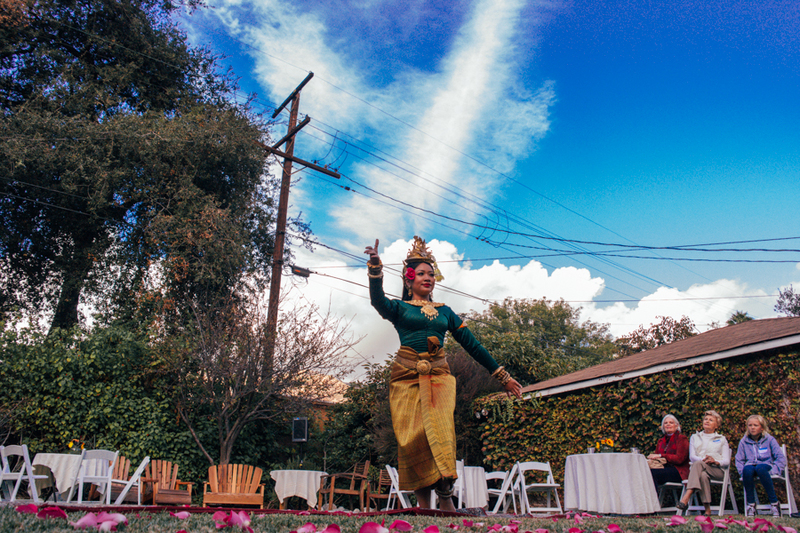 We would especially like to thank the Khmer Arts Academy who graced us with a wonderful classical Cambodian dance performance. (See pictures below! Thanks to DonegeeMedia for covering the event) All of us at Community First are incredibly honored for the presence of so many passionate people who are excited for the work we are doing in Cambodia. Without your energy and passion, all of our work would not be possible. 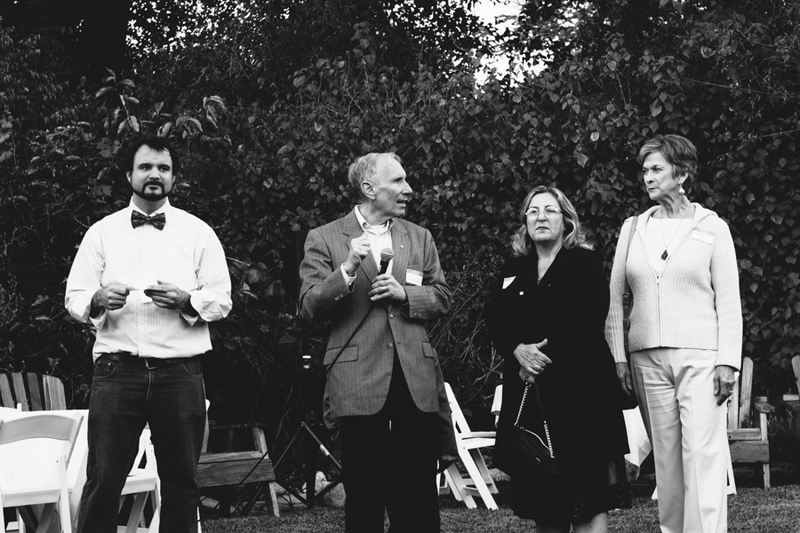 If you’d like to see the entire gallery of the event click here. 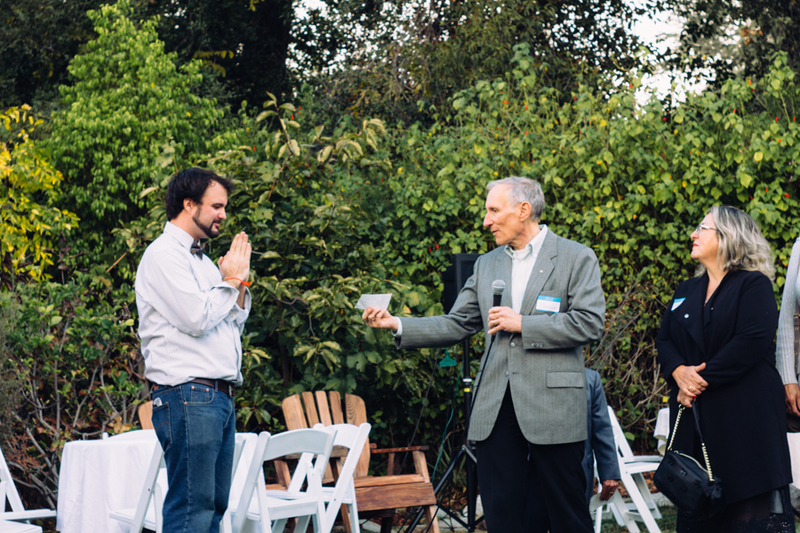 We would especially like to give a big shout out to the Rotary Club of Sierra Madre and Compassionate Rescue, a Sierra Madre nonprofit organization, who graciously donated to Community First to ensure that our efforts in Sen Sok can continue. Keep up to date by liking our facebook . Make sure you keep connected to our blog to get the latest information about our continued work abroad.